But no matter how busy they are, Nik and Brianne can always be found with big smiles and high fives all around. 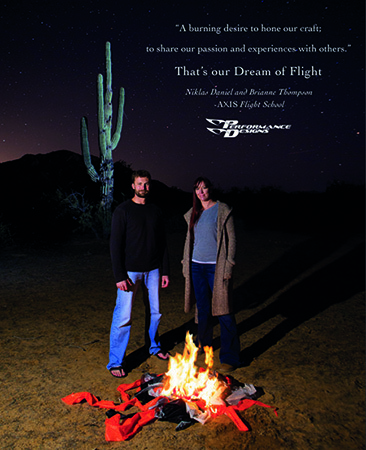 They love what they do and they&apos;re good at it – just two of the many reasons we featured AXIS Flight School in this month&apos;s Dream of Flight ad. 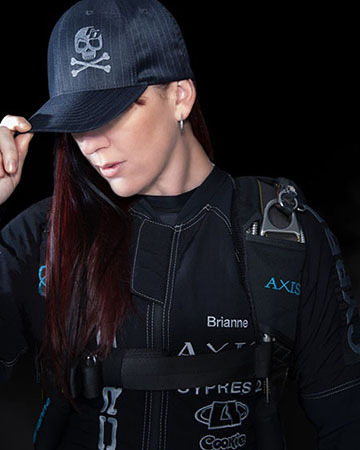 AXIS Coaches™ Nik and Brianne both started skydiving early in life, at a time when they had – like many of us when we first started jumping – big dreams and small bank accounts. Brianne spent her high school graduation money on AFF, while Nik took months to get through AFF due to financial constraints. But each was persistent, putting every spare minute and dollar into jumping and tunnel flying. Brianne started developing her 4-way FS skills early on in her jumping career, joining her first team in 2001 at just 75 jumps. Nik, on the other hand, caught his break when he discovered tunnel flying in 2005. “Right after I graduated AFF, I won a five minute gift certificate for the wind tunnel,” he said. “After that, I would go there every day, sit in front of the glass, and stare at people fly. It came to the point where I realized &apos;This place makes me happy.&apos;” Just a couple of weeks later, he applied for an instructor position and started his career in skydiving. Brianne met Nik while she was coaching a student in the Perris tunnel. “[Nik] was supposed to be driving and paying attention to the student, but he was staring at me the whole time.” They immediately became friends and soon after that Nik was invited to shoot video for Brianne&apos;s FS team Spaceland Blue, a team that went on to medal in both the 2008 and 2010 World Championships. 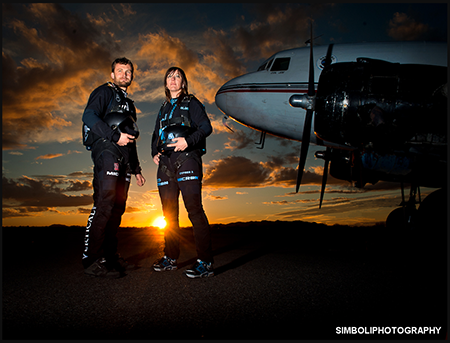 Though they loved competition, Nik and Brianne felt that something was missing from the skydiving community. They would often chat about the rift in the sport between jumpers in different disciplines. “We didn&apos;t like that people didn&apos;t like tunnel instructors, belly flyers didn&apos;t like freeflyers, and freeflyers didn&apos;t like belly flyers,” said Brianne. “But really, it&apos;s all the same! 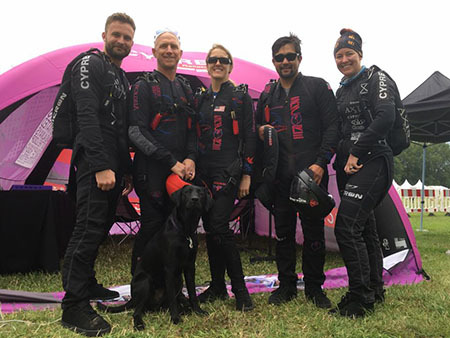 It&apos;s just pushing air around!” They wanted to see a fundamental shift in the community where skydivers could come together instead of drawing lines in the sand between disciplines and skill level. And with that, the idea of AXIS Flight School was born. 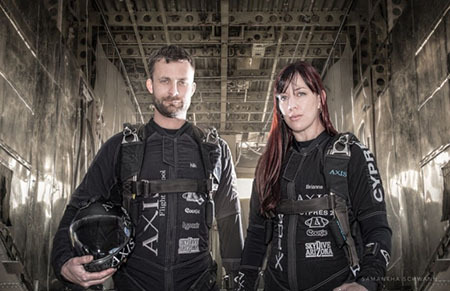 Since its founding, AXIS Flight School has continued to grow. 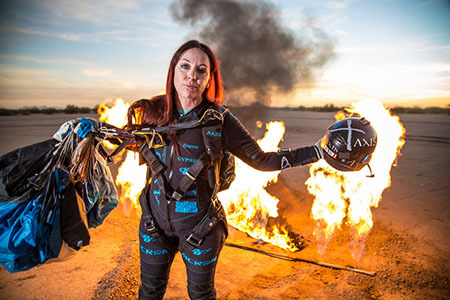 What started out of the trunk of a car in 2010 is now the official coaching entity at Skydive Arizona, one of the largest dropzones in the world. And their success hasn&apos;t stopped there. 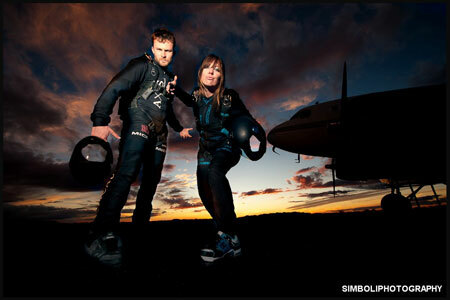 Even if you have never met them, you might recognize Nik and Brianne from the Foundations of Flight section of Parachutist or from their various features in skydiving magazines all over the world. But no matter where their dedication and talent take them, they are never “too good” to talk to the new jumper at their dropzone – in fact, that actively fight against what some might call the “elitist” culture in skydiving. We learned a long time ago that we are not capable of predicting someone else&apos;s potential. Earning a living in skydiving can be difficult. Brianne and I lived in a trailer for many years and made many sacrifices in order to be able to pursue skydiving full time. We got our tandem and AFF ratings and started working for various skydiving schools, doing tandems, teaching AFF, and doing video. We dreaded bad weather days or anytime one of us got sick because we could not work. We loved skydiving, but our hearts were in competing. Brianne was chasing her second world championship in 4-way FS, and I was a wind tunnel instructor and canopy-pilot fledgling who wanted to fly his body and canopy the best he could. Wind tunnels were still a new concept back then, with only a hand full of them around the world. As our skills grew through traveling and competing, jumpers became interested in what we knew and what our experiences had taught us. We did not set out to be teachers; we just really enjoyed getting other jumpers involved in what we were doing. In 2007, Brianne and I were in a coffee shop in California, discussing the very palpable line in the sand between belly flyers and free-flyers. At that time the skydiving culture was such that you had to be on one side of the fence or on the other. While talking about it, we always came back to the point of how much one discipline could learn from the other. It also quickly became evident that we shared the same outlook on our sport and we began to fantasize about a hypothetical place that embodied our philosophy and values. Our vision included a coaching method that was more articulate and detailed than what we had experienced from other coaches at the time with a higher level of professionalism. We wanted a clear language and a curriculum that was easy to understand. A thought out coaching method that provided direction and was structured with layers of knowledge and drills. We chose the name AXIS Flight School because we wanted to create an inclusive sanctuary of learning for all axes of flight. What started out as a small tunnel coaching business out of the trunk of our car, eventually found a home at the world&apos;s largest drop zone in the world (that story is for another time). Now we coach body-flight in the tunnel, canopy for various levels, camera flying, 1-on-1, and competition teams full-time. Being our own bosses and being able to run our business the way we want is a dream come true. What do most people not know about AXIS? Everything we teach at AXIS was first honed in the competition environment. We don&apos;t think of ourselves as “jacks of all trades”, rather we strategically specialize in each disciple we coach for a number of years with the intent of competing at the world level. We managed to do that and have medaled in 4-way FS and in 4-way VFS multiple times. We continue to strive for that goal in order to keep our skills sharp and our knowledge up to date. Brianne and I have been competing together for years. Cu, rently we are teammates on a 4-way VFS team, 2-way MFS team, and have done 4-way FS player-coach teams in the tunnel. 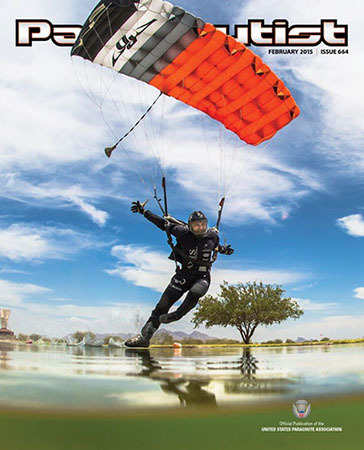 Our dedication to further educate on a continuous basis is still strong and reflected by our monthly articles series “Foundations of Flight”, published in Parachutist magazine since 2011, featuring articles on safety and training. I don&apos;t think many people know about the many features of your website – what are the most stand out apps that you want to make people aware of and your intentions of providing these resources? The “AXIS Tools” on the AXIS website are an ongoing project. It first started out as an improved at-a-glance-screen, which we had in our office. We were most interested in the manifest calls and weather conditions. However, since its inception, we have added several other “apps” and made it mobile friendly. We have developed special calculators for various tasks, such as calculating the appropriate exit separation, reserve repack dates, canopy wing loading, downsizing progression, and much more. So again, safety is definitely a major intention of sharing these resources. We also try to find new ways of improving what our tools are capable of. For example, to increase the accuracy of our weather conditions page, we invested in our own weather station for greater accuracy. Photo by Mark “Trunk” Kirschenbaum. I think the most popular feature is the Draw Generator (currently on version ). AXIS has invested a lot of time in creating the proper code for all the various disciplines and divisions. We have also created our own formation images to be copyright independent. The AXIS DG is a fantastic tool for competitors of all skill levels. If you are a beginner, you can generate a draw and use the “Images & Names” function to learn the formations. For more experienced flyers, you can print out the pools, save PDF version and send them to your teammates. For coaches, you can use the “Training Camp” feature, which acts like a digital whiteboard. And in the AXIS Flight School spirit, we made the generator applicable to as many disciplines as possible, including traditional 4-way, VFS, MFS, CRW, and many more. How did you get involved working with Operation Enduring Warrior? Having wounded vets with amputations and other life-altering injuries join our sport began mostly as a thought experiment during dinner. Our friend Murv, who is a Major in the US Air Force, asked if it was possible to teach an amputee to skydive. Without hesitation, we said, “Yes, of course. But it depends heavily on the injury, and that person&apos;s attitude and mental alertness to solve problems. In addition, it will take time, specialized training and equipment”. We paused, but never threw in the towel. Our answer was still “yes”. This is when Murv revealed that she knew Todd Love, a 22-year-old Marine who had survived injuries in Afghanistan from an IED. His injuries were extensive, causing the loss of his left arm below the elbow, and both of his legs below the waist. Despite all this, Todd had made an amazing recovery and was now exploring the world of sports again. He was swimming, mono skiing, and even doing Spartan races. But what he wanted to do more than anything else was skydive. After meeting Todd, Brianne and I were convinced that achieving his goal of skydiving was possible. Related: Todd&apos;s Story, and first tunnel training. Related: Nik&apos;s blog post about Todd&apos;s training. What have been some of the challenges and successes with OEW? We feel that one of the clearly biggest successes with this work is that men and women who have been severely injured and who have been enduring life-changing traumatic experiences have the opportunity to learn that they can still do a lot of things they have given up on, due to their injuries. They are now building up a new confidence that transfers to many other areas of their lives. We never looked at our students and said: “How do we get him or her to the A license?”; rather, “How do we include this person as a functioning member of our sport?” This is because we consider the A-license as a short-term goal (a license to learn). 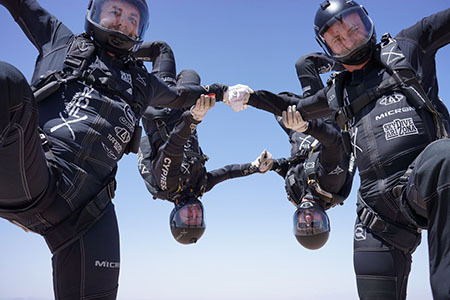 Most of the challenges that face OEW graduates have nothing to do with the initial training process, but what happens after they are released into the skydiving world. 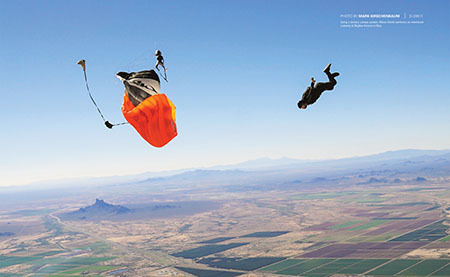 Packing and maintaining their specialized gear, staying current, and advanced training such as FS, free-fly, canopy, higher licenses, and ratings, may be challenging to receive elsewhere. Similar to most post-A license students, OEW graduates suffer from fitting into the community. They must find their own identity. This appears to be magnified with OEW jumpers because their needs and experiences are different from that of the norm. Continuing in the sport requires motivation through education, encouragement, and a feeling of belonging. AXIS has branched off to create a 4-Way VFS team – what inspired the idea of the team? Brianne after swooping through a wall of fire (Valkyrie advertisement) by Justin Carmody. Nik: “Ever since we started jumping, Brianne and I have been competing. I first started competing as a 4-way FS videographer, filming multiple teams. Later I also competed in free-fly, canopy piloting, and indoor meets. When we moved to Arizona I was very happy to be picked up by “Arizona Arsenal”. I started as an alternate/videographer, but then transferred to the inside in 2013 as point flyer to compete at the 2014 world championships in the Czech Republic. As Arsenal was on the fence about continuing to compete in 2015, I quit the team and joined the newly formed team spearheaded by Brianne: Arizona X-Force. The X is an homage to AXIS, with the letter being stylized the same. What are the upcoming projects you&apos;re working on and future goals of AXIS and X-Force? I think we are always trying to improve on what we currently do. A personal goal is to put greater focus on MFS. We had a blast competing at the 2017 Nationals, but went into it with no real training as our main focus was 4-way VFS. We keep wondering what else we can do and how to make it as awesome as possible. You both are incredibly hard working – do you take any time off? What do you do to unwind? We are actually really bad about taking time for ourselves. We definitely need to do more of that. Still working on that goal. I guess we just live and breathe this stuff. How do you balance all the AXIS school work, outside projects, OEW, the team etc? Time-management is critical. For the most part we have our entire year planned out in advance. Capitalizing on the ebb and flow of the DZ, weather patterns, etc. There are times, however, where we do get overwhelmed. We are pretty busy. But, we just recognize that those super busy times are temporary. We do our best to get through it as best we can. It can be disappointing sometimes when we have to cancel something or turn a project down. That can be really hard, but it is impossible to do every single thing we want to, when we want to. Sometimes it has a way of working itself out, and other times we are super bummed we had to let something go. Oh well. There is always next year. Did I miss anything that you&apos;re involved in?